Significance – As the Civil War raged in the East, drifter James D. Clark bounced around from job to job, and finally landed one at the Denver Mint and a scheme came quickly to mind. His robbery strategy was simple fill his pockets with as much gold as possible and get out of Denver. One day in February 1864, Clark left work with more than $37,000 in gold and treasury notes stuffed in his pockets. His plan was to head to Colorado Springs, but he got lost along the way and was eventually captured. When officers arrested Clark, they recovered only $32,580 in gold.? The whereabouts of the remaining gold bars still remains a mystery. Today, the Denver Mint is the single largest producer of coins in the world. The first man to rob the Denver Mint was Small Bad Jim James Clark. The gold bars were so heavy that he began dropping them only one mile away in what is now Cheesman Park. Six days later, the desperado was captured 25 miles south of Colorado City. His horse had deserted him and Jim was in tears. 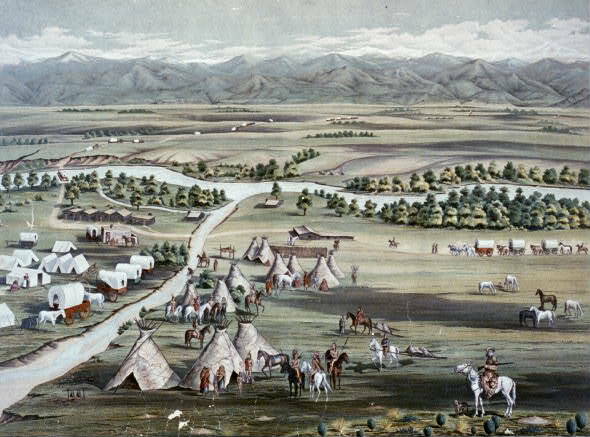 Details – On July 9th, 1858, William G. Russell struck gold near the confluence of Cherry Creek and the South Platte River, located at the foot of the Colorado Rocky Mountains. The city of Denver was established later that year. As was typical of rapid migrations of people into sparsely inhabited areas, the Colorado miners and merchants had very few coins or paper money to transact business. Gold dust was the money of the realm. It was usually carried in buckskin pouches and was weighed out on scales at the stores. In the absence of scales a pinch of dust (the amount normally taken up between the thumb and fore finger) was counted as twenty-five cents and purchases were rarely made for less than that amount. Additional denominations were produced. In the almost three years of operation, Clark, Gruber & Co. minted $594,305 worth of Pike’s Peak Gold in the form of gold coins. The Denver Mint was established by an Act of Congress on April 21, 1862. Subsequently, the Clark, Gruber & Co. was formally bought by the US Treasury in April 1863, reopening later that year as a United States Assay Office. Laws were changed and it was no longer legal for private individuals to mint gold coins of their own design. 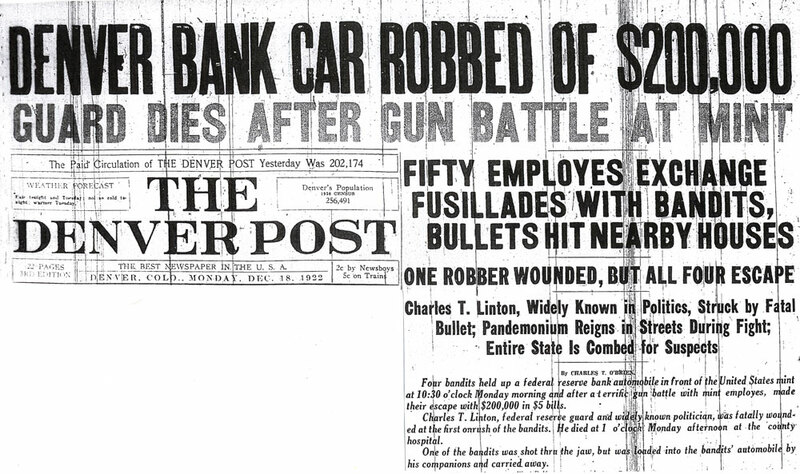 James D. Clark, the first man to rob the Denver Mint, bounced around from job to job, but finally landed one at the Mint. His plan was simple stuff his pockets with as much gold as possible and get out of dodge. One day in February he pulled it off. Clark left work with more than $37,000 in gold and treasury notes stuffed in his pocket and planned to head to Colorado Springs. Unfortunately for him, he got lost east of Denver. He also lost his horse. Officers captured him and recovered $32,580 in gold. More than $4,500 still remains unaccounted for to this day. Clark was hauled off to jail but escaped a short time later. Some time passed, but Clark was spotted north of Denver by a Deputy. He was rearrested and tried for his crime. His sentence? He was banished from the territory. 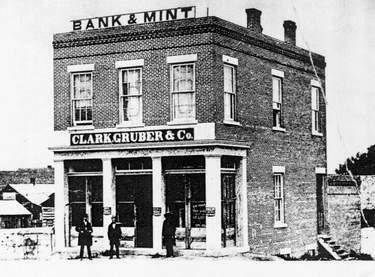 Clark, Gruber & Co. remained a bank until bought by the First National Bank of Denver in 1865. THE DENVER MINT – The current Denver Mint building at 320 W Colfax Ave is a branch of the United States Established by Congress in 1862. At this time, the yearly value of the gold and silver deposited at the Denver Assay Office was over $5.6 million. Originally, the Denver Mint operated for more than four decades as an assay office, determining the quality of bullion but not producing any coins. In 1872 a group of businessmen saw opportunity. Judge Hiram Bond (formerly one of the largest brokers on the New York Gold Exchange), Joseph Miner and Denver Mayor Joseph E. Bates set up the Denver Smelting and Refining Works built an independent plant which processed ore into ingots which were then assayed, weighed and stamped by the Denver Mint. In 1895, Congress finally authorized the establishment of a mint in Denver for gold and silver coin production and by 1896 plans were underway. A site at West Colfax and Delaware streets was purchased for approximately $60,000. The mint building was designed in the Second Renaissance Revival style. The New York architectural firm of Tracy, Swartwout, and Litchfield, designed a building based on the Palazzo Medici Riccardi in Florence. The exterior facade was to be made of rusticated Colorado granite, with ashlar granite rising above to a decorative frieze just below the red-tile roof. Appropriations to complete and equip the plant were insufficient. In his 1900 Annual Report, the Treasury Departments Supervising Architect James Knox Taylor wrote, A contract is in force for the erection of the superstructure…but the progress made has been most unsatisfactory. Contracting for work seems to have been a concern throughout the buildings construction, thus delaying its timely completion. In his 1902 Annual Report, Taylor reported, Only one bid having been received [for interior finishing], the Department decided in the absence of competition that the same should be rejected and new proposals asked. Francisco. Coinage operations finally began on February 1, 1906, establishing the Denver facility to Branch Mint. During the first year, 167 million coins were produced, including $20 gold (double eagle) coins, $10 gold (eagle) coins, $5 gold (half eagle) coins, and assorted denominations of silver coins. Over time, the Denver Mint has seen several additions to make room for greater production and increased storage. The original building, which fronted West Colfax Avenue between Cherokee and Delaware Streets, has grown to occupy the entire block between West Colfax and West Fourteenth Avenues. The first two additions, in 1935 and 1946, extended the mint to the south. The extra space was necessary in part because in 1934 the government transferred one-third of the countrys gold bullion from San Francisco to Denver, which provided a more secure, inland location. The additions are designed the Second Renaissance Revival style similar to the original building with some modern design elements. By the 1960s the mint was in need of repairs and upgrades. The federal government had two options: renovate the existing building or move to a new location. The government ultimately decided to keep the mint at its existing location. Preservationists nominated the Denver Mint to the National Register of Historic Places (NRHP) as a precautionary measure . . . in order to protect the existing structure. Added in 1972, the Historic American Buildings Survey reported, As one of two United States coinage mints in operation at this date [the early 1900s], the Denver Mint can easily be defined in terms of national significance. Within the context of local history, however, the Mint has played an equally significant role, symbolizing continuity in the development of Denver from a frontier mining center to a major metropolitan area. The US Mint in Denver. visitors center on the east side of the building to accommodate its roughly 500,000 annual visitors. This also led to the redesign of the 1985 addition. ?Completed in 1992, the final structure better incorporated motifs from the original building. The final addition to the Mint came in 1996, when a die shop was built on the western edge of the property. Constructed of precast stone, it replicates elements of the original buildings facade. It is the perhaps the finest example of restrained Renaissance classicism found in the city. Today, the Denver Mint is the single largest producer of coins in the world, producing coins for circulation, as well as mint sets and commemorative monies. It continues to store bullion along with the mint facilities in Fort Knox, Kentucky, and West Point, New York. Coins produced at the Denver Mint bear a D mint mark. Prior to 1864, it was legal for private individuals to mint gold coins. What was the name of Denvers first mint? When did the first U.S. Mint open in Denver? The Denver Mint is a branch of which part of government? 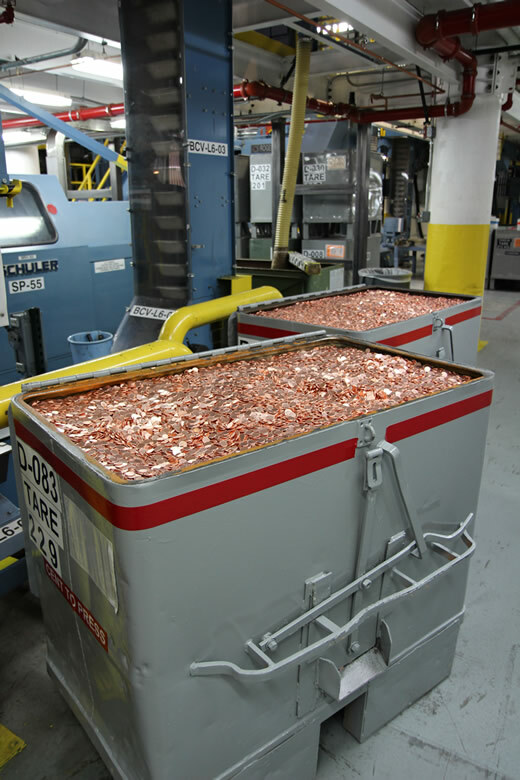 Which U.S. Mint produces the most coins? How has technology impacted the U.S. Mint?